Hotplates, stirrers, and hotplate stirrers feature an exceptionally durable, chemical resistant white ceramic work surface. Advanced microprocessor controls allow quick, precise adjustment and maintenance of speed and and/or temperature. 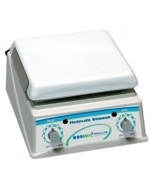 Magnetic Stirrer 7.5" x 7.5"
Hotplate Magnetic Stirrer 7.5" x 7.5"